Menu is an important user interface component which provides some action options for a particular activity. In this post I’ll show the basics for setting up a menu. The activity will contain 2 menu options: Add and Help. When clicking an option menu, a Toast notification will be displayed. 2. 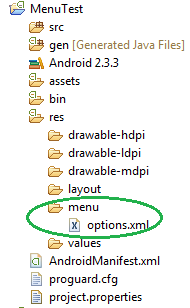 Android provides a standard XML format to define menu items. So, instead of building the menu in the activity’s code, we will use the XML resource. Later, the XML resource is inflated in the code. – The onCreateOptionsMenu() method inflates your menu defined in the XML resource. – The onOptionsItemSelected() method handle click events. When the user selects an item from the options menu, the system calls the onOptionsItemSelected() method. This method passes the MenuItem selected. 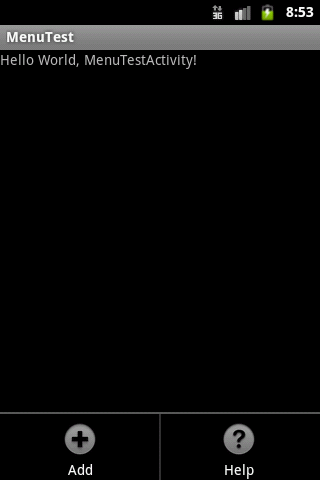 The MenuItem can identify the item by calling the getItemId() which returns the unique ID for the menu item defined by the android:id attribute in the menu resource. Depending of the returned ID, we display the appropriate Toast notification. 5. Finally, run the application and click the “Menu” button on the emulator to launch the menu. Can You help me in suggesting me a way to create submenus in android. how to create call to set wallpaper?